A European start-up has announced a hydrogen fuel cell car with just 18 moving parts and a range of 300 miles that is now being tested on public roadways. The Rasa hydrogen fuel cell car from Riversimple Movement has a chassis made from carbon fiber composite skin weighing less than 90lbs. The Rasa is a two-door hatchback with a carbon fiber chassis that weighs less than 90lbs. While a Rasa prototype, which has a top speed of 60mph, is currently being tested on European roads, a one-year public beta trial of 20 vehicles with prospective customers is being proposed for later this year. The company did not release any pricing information on the Rasa. The car is expected to be on the market beginning in 2018 through a "sale of service" ownership model, which is similar to a lease where a driver has a fixed monthly fee and mileage allowance. With a sale-of-service agreement, Riversimple covers all repairs, maintenance, insurance and fuel expenses of its new, two-door hatchback. "The Rasa engineering prototype marks another key milestone in bringing an affordable and highly-efficient hydrogen-powered car to market. We really have started from a clean sheet of paper," Hugo Spowers, founder of Riversimple Movement, said in a statement. "The car is simple, light and fun in every respect." When the vehicle is in motion, hydrogen passes through a small 8.5 kilowatt (kW) fuel cell (the size currently used in forklift trucks), which has the equivalent to 11 horsepower. As the hydrogen passes through the fuel cell, it combines with oxygen to form water and electricity to drive the motors positioned in each of the four wheels. Water is the only exhaust. More than 50% of the kinetic energy produced under braking is recovered and turned into electricity to boost acceleration via a bank of super-capacitors. The result is a range of up to 300 miles on 85 ounces (1.5 kilograms) of hydrogen; that's an estimated fuel economy equivalent to 250mpg. Development of the Rasa was supported by a £2 million grant from the Welsh government in 2015. Major automakers around the world have announced plans for working hydrogen fuel cell vehicles. One major issue facing the clean-energy vehicles is a lack of infrastructure to support them -- in other words, the lack stations at which to fuel the cars. 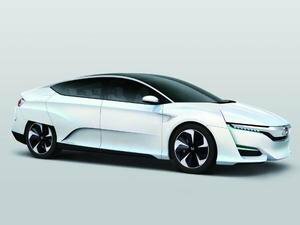 Last year, Toyota, Nissan and Honda announced they will increase efforts to produce more hydrogen fuel cell vehicles and plan to work together to build more fueling stations to support them. Despite slow market uptake, Hyundai Motor Co. said last year that hydrogen fuel cell vehicles represent the future of eco-friendly cars more than all-electric vehicles. Hyundai, the largest carmaker in South Korea, began selling its Tucson Fuel Cell SUV in 2014. This story, "This car travels 300 miles on just 85oz of (hydrogen) gas" was originally published by Computerworld.